An Atomic Instrument Company Model 111 computer tube module from the late 1950's early 60's. Click image for larger view. Program drum for an IBM 29 card punch (and similar models) punch card machine. Click image for larger view. SLT Logic module from an IBM 360 or 1800. Click image for larger view. 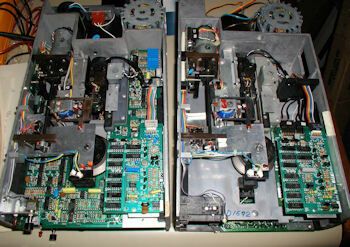 A Royal Precision LGP-30 clock gen module. I had written about this machine earlier, LGP-30 thread. Click image for larger view. Ancient electronic components that seem almost aquatic in nature. Click image for larger view. Many of these items require research to identify properly. Please share any information/details you may have about these items, I will post on this thread.